Steam cauliflower florets until fork tender and set aside to cool. Heat 2 tablespoons olive oil in heated skillet, then sauté onions with sea salt until soft. Add garlic and nutmeg powder. Continue to sauté for a couple of minutes. Add vegetable broth, remove from the heat and set aside. In a food processor, add steamed cauliflower and vegetable mixture. Process until completely smooth. Add white miso and black pepper, and blend well. Add 1 tablespoon olive oil and almond milk, if using, and process until everything is well combined. Place the sauce back in the skillet. Boil linguine per package instructions and drain. Add the linguini to the Alfredo Sauce in the skillet, mix to combine. Adjust the flavor by adding sea salt if necessary. 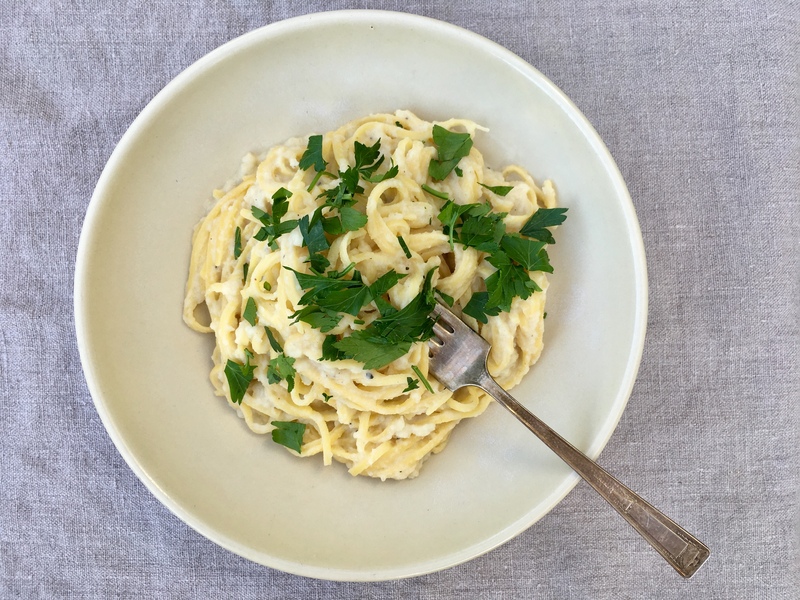 Serve the Linguini Alfredo topped with chopped parsley for garnish. The sauce keeps well in the refrigerator for 3-4 days. Just warm gently in a skillet when you reheat it, and add vegetable broth or water to thin it out if needed.